When asked by his high school guidance counsellor what he liked doing, Paul Wright said "looking out the window", to which the educator explained that he would likely never find a job doing that. From the bridge of Cunard Line's newest liner, Queen Mary 2, Captain Paul Wright proves that counsellor wrong on a daily basis. Capt. 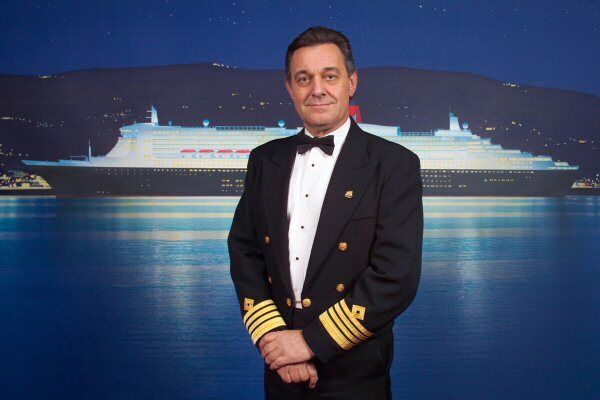 Wright was named master of QM2 in 2003 after serving in various ship management posts for Cunard since 1980. Prior to assuming the helm of the largest, longest, tallest and grandest vessel afloat, he was master of Queen Elizabeth 2. He has also been master of Cunard Crown Dynasty and the line's last remaining cargo ship, Atlantic Conveyor, a 60,000-ton container vessel. Other shipboard assignments have included serving as staff captain on board QE2, Cunard Countess, Cunard Princess and Sagafjord. Shoreside management positions have included serving as marine operations manager in Cunard's New York headquarters and as marine superintendent in both New York and Miami. Capt. Wright's first Cunard appointment was to Cunard Countess as First officer. He was on duty in 1982 when that ship was requisitioned by the British Ministry of Defense as a troop transport ship in the Falkland Islands conflict. Wright first went to sea in 1966 for Shell Tankers. After completing his cadetship he joined Canadian Pacific and sailed on their cargo and passenger ships. From there he worked on various container, cargo, tanker, ferries and hovercraft gaining his masters certificate in 1976. A native of Worcester, England, Capt. Wright lives in a small village called Malpas in Cornwall. When on leave he is never far from the sea, on his own 30-foot ketch.